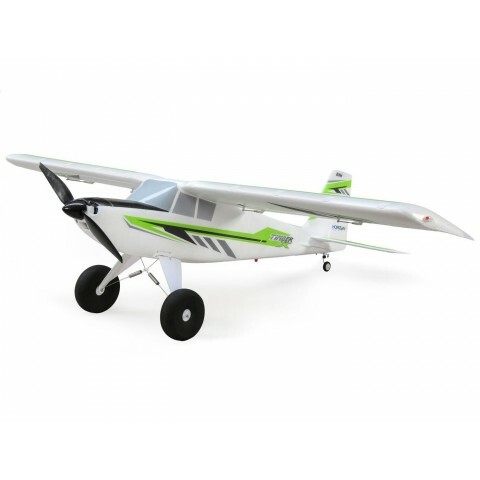 Many RC pilots got their first taste of flying a Short Take Off and Landing (STOL) capable airplane with the original E-flite® Timber® 1.5m model. Its fly-almost-anywhere abilities, friendly handling and nimble sport performance helped it become one of the most popular RC aircraft of all time. The Turbo Timber 1.5m marks the latest evolution of the iconic design with the addition of metal-geared servos, a 3S and 4S compatible power system, plus a turboprop-styled nose and 3-blade propeller for more performance and capabilities than ever before. Thick grass, gravel paths, dirt trails- even local lakes and ponds- you can fly off of these and many other surfaces that are impossible for most models of this size to handle. The shock-absorbing landing gear is equipped with oversized, tundra-style wheels that soak up the bumps of rough surfaces and provide excellent prop clearance. The included float set matches the trim scheme of the airplane and features dual water rudders for superb steering control.